An interactive installation in the form of large-scale woven and connected panels constructed with traditional yarns and clear tubing. The tubing serves as a conduit for colored solutions that act as pixels in a display, producing patterns and images which will exist on their own as well as trigger augmented reality overlays to tell a story. Colors pumped through the textile will create programmable images, patterns, and messaging uploaded to the cloth, transforming a commonplace, familiar, almost primitive material, into a surprising technology. 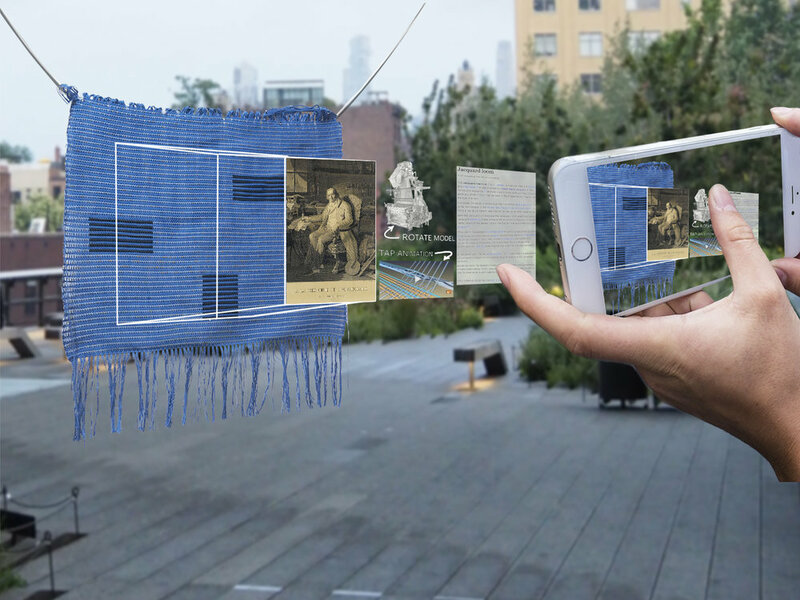 We hope to utilize this functionality to tell a story using uploaded imagery as well as augmented reality triggered through shifting patterns on the textile. All of this interaction will support the creation of conversation on the social benefits and detriments of modern technology. Rendering: This portrait of Joseph Marie Jacquard was once woven in silk to demonstrate the capabilities of his revolutionary loom. Dyes like copper (commonly used in electrical circuitry) have historically and cross-culturally acted as a binding agent for natural fiber dye processes and produces a vibrant and permanent green. The panels, fixed to a structure that allows them to hang vertically, will be woven by hand by the artists. Created on a large scale, this installation will create an environment that viewers can be “within,” creating an immersive and reflective atmosphere. Electro-painting with verdigris by Julian. In 1801, Joseph Jacquard invented a system that could orchestrate production of intricately patterned cloth. His advanced loom was the first machine to automate task production and thus the first computer. Inspired by Jacquard, Charles Babbage designed the “difference engine” in 1822, the first mechanical computer capable of memory organization, instruction based operations, and input/output units. Ada Lovelace used this machine to create the first computer code and her and Babbage's work directly led to Alan Turing's well-known innovations. These functionalities trace back to the nuances of loom operation and weaving construction and have become the basis for our ubiquitous modern computers. We depend on these computers for everything from our social lives to our health care, yet this ancestor seems more distant than it actually is. By integrating antique weaving techniques and modern computer technologies, “c o m p u t e r 1.0” is a visualization of the computer’s history from birth to the present day along with the pros and cons of our dependance upon them. Our relationship with textile is innately intimate and while different cultures have ascribed varying meanings to their textiles, the essence of the experience is the same no matter who you are. Cloth is an incredible equalizer and is perhaps the one thing that we all share. But the unique equality of cloth is no longer so unique. Our relationship with technology has recently become dominant in this equalizing function. Whether it be the dislocation within society, or the empowerment of disconnected communities, the varying ways in which we interact with technologies (both for good and for bad) are being questioned now more than ever before. Perhaps understanding the history of these technologies can help us consider technologies for the future. Contextualized within a public setting, this installation suggests that viewers more closely examine their relationships with technology by way of their relationship with cloth. We hope to supplement our physical installation with educational programming relayed through our pocket-born descendents of the loom, utilizing Augmented Reality and crowd sourced interaction that will accentuate this reflective experience. Victoria Manganiello is an artist whose paintings, installations, and performances explore the intersections between materiality, space, philosophy and storytelling. Working primarily with fibers and dyes, she hand weaves all of her canvases, incorporating abstract imagery inspired by geography and statistical information formed with natural and synthetic pigments and dyes she mixes herself. An adjunct professor at NYU and Parsons New School, Victoria sees art and design as powerful and essential tools for communication. Her work has taken her around the world including to Japan, Morocco, Bulgaria, Ecuador and across the USA. ... is a designer whose work explores the convergences of technological innovation and society. Through constant study of emerging technologies, materials, and manufacturing techniques, his practice focuses on transforming novel research into culturally meaningful, future-focused, human-centered applications. Through making, both analog and digitally, Julian seeks to take part in designing a better future through compelling objects and experiences.